These five charts explain how this small cap tech stock rallied 40% over the past year. 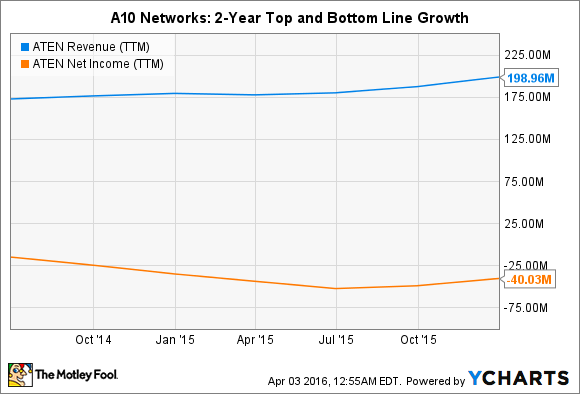 Many investors might be unfamiliar with A10 Networks (NYSE:ATEN), a small-cap provider of advanced application networking technologies. Yet its stock has quietly rallied more than 40% over the past 12 months, easily outperforming the NASDAQ's flat growth. To decide if A10 is still a worthy buy after those gains, let's discuss five simple charts that explain what A10 makes, how it makes money, the customers it serves, and the headwinds it faces. A10 sells three networking enhancement solutions: Application Delivery Controllers (ADCs) for optimizing data center performance, Carrier Grade Networking (CGN) products which translate addresses and protocols for service provider networks, and Distributed Denial of Service Threat Protection Systems (TPS) for network security. It also recently introduced a convergent firewall (CFW) to complement its TPS platform. All these platforms are built on its Advanced Core Operating System (ACOS). During its most recent investor presentation, A10 claimed that its ADC, CGN, and TPS products were all superior in price and performance to comparable products from its closest rivals -- F5 Networks (NASDAQ:FFIV), Cisco (NASDAQ:CSCO), and Radware (NASDAQ:RDWR). Cisco once competed against F5 and A10 in ADCs, but it dropped out of that market -- which F5 controls roughly half of -- in 2012. Cisco subsequently integrated A10's ADCs into its ACI (application centric infrastructure) ecosystem, which widened A10's moat against F5 and other rivals. A10 serves about 4,700 customers in 72 countries, with revenue split almost evenly between large enterprises and service providers. Last quarter, the company gained 200 new customers, while its enterprise bookings rose 23% year-over-year. This chart reveals just how diverse that customer base has become. A10's client list is impressive, but investors should note that a reduction in spending from either group could hurt A10's top line growth. Large enterprise customers have notoriously fickle spending habits, and some wireless carriers are postponing infrastructure upgrades in favor of expanding their digital ecosystems to gain customers. A10 doesn't break down its product sales by category, but ADC sales likely generate the majority of its sales, while CGN and TPS sales account for much lower percentages. During last quarter's conference call (as transcribed by Thomson Reuters), the company admitted that TPS sales accounted for 10% of its fourth quarter and full year sales. As seen in the following chart, A10 generates the majority of its revenue from product sales, which support its service revenues. It also generates a large portion of its sales from overseas markets, which exposes it to currency headwinds. The majority of A10's overseas sales are invoiced in U.S. dollars, with the most notable exception being Japan, where sales are invoiced in Japanese yen. In its most recent 10-K filing, A10 admits that "hypothetical" 10% adverse or favorable currency swings between the dollar and the yen could respectively move its annual revenue up or down $3.6 million -- about 2% of its 2015 sales. Over the past year, A10 posted a streak of impressive sales growth compared to industry rivals F5, Cisco, and Radware. A10's price to sales multiple of 1.8 also remains lower than the P/S ratios of all three companies. YOY revenue growth. Source: Company earnings reports. But despite that robust sales growth, A10 still isn't profitable. The company hopes to turn a profit this year, but its track record since its 2014 IPO suggests that it could be an uphill battle considering its sales and marketing spend rose 10% annually and claimed nearly three-fourths of its revenue last quarter. By comparison, F5, Cisco, and Radware were all profitable in their most recent quarters. A10 isn't a stock for risk averse investors, but the company's best-in-breed products, growing customer base, and strong sales growth make it one worth watching. The company could be hurt by slowdowns in enterprise and service provider spending, or aggressive pricing and bundling strategies from its rivals -- but investors willing to ride out those speed bumps might be rewarded over the long term.